Failed Emissions Test. My car failed the emissions test - SmogTips.com. Review your vehicle's smog check Vehicle Inspection Report (VIR), and select the emissions category which your vehicle failed. Download our FREE Illustrated Top 10 Smog Check Failures poster in PDF. Why did my car fail the emissions test? Failing the emission test is not a pleasant experience, but it's not the end of the road either. In fact more then likely, once you repair the faults which caused your car, truck, van, SUV, or RV to fail it's emissions test, your vehicle will be running better, more efficiently, and wasting less fuel then before; saving you hundreds in gas dollars. Think of failing the emissions test as a positive experience rather then a negative one. Where you may have not noticed your vehicle is or was not performing at it's best and wasting fuel, failing the emissions test will identify this condition and allow you to fix the problem. You will absolutely save money on the long run. The smog technician who performs the emissions test will give you a Vehicle Inspection Report (VIR). The VIR will indicate which of the three harmful emissions (HC, CO, NOx) caused your vehicle to fail the emissions test, as well as include the results of the entire smog check inspection. The VIR is a common diagnosis tool used by emissions test repair technicians to ascertain where to start their diagnosis. Above we indicate the top reasons for emission test failures. To use this guide, have your vehicle's VIR at hand. If you have not yet performed your car's emissions test, you will not have a VIR to follow, and can use the links below to educate yourself before hand. Toward the bottom of your vehicle's VIR you will find "ASM Emission Test Results". This section will indicate the emission results your vehicle produced. "MAX" indicates the maximum emissions allowed for the particular pollutant, based on your vehicle's year, weight and engine size. "AVE" indicates the average emissions produced by vehicles of the same year, make and model. "MEAS" (which is circled on the image below) indicates the emission results your vehicle produced, and it is the measurement you need to be concerned with in relation to the maximum limits allowed. Measured "MEAS" amounts above the state's cut-off, or maximum limits, will cause a failure. CO2 and O2 - Carbon Dioxide and Oxygen are measured as well. However these emissions do not determine a passing or failing emissions test. 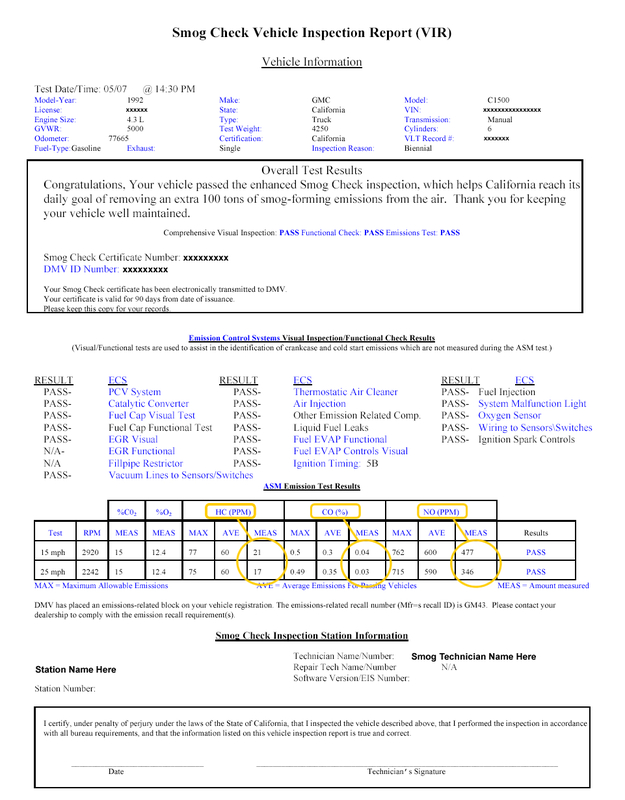 Online VIR Diagnosis - SmogTips can diagnose your vehicle's emissions test results online. If your smog test was conducted at a SmogTips certified emissions test center, this service is free. Failing the emissions test may require a hands-on diagnosis.